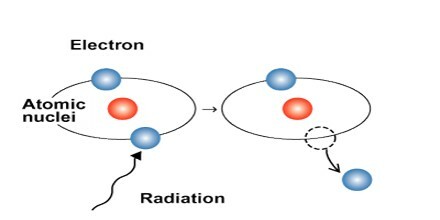 Ionization is when an atom becomes an ion, by either gaining or losing electron. Unstable do atoms of an element become when ionized. It is one of the principal ways that radiation, such as charged particles and X rays, transfers its energy to matter. Ionization can occur through radioactive decay by the internal conversion process, in which an excited nucleus transfers its energy to one of the inner-shell electrons causing it to be ejected. Ionization by collision occurs in gases at low pressures when an electric current is passed through them. In general, occurs whenever sufficiently energetic charged particles or radiant energy travel through gases, liquids, or solids. Charged particles, such as alpha particles and electrons from radioactive materials, cause extensive ionization along their paths. A certain minimal level of ionization is present in the Earth’s atmosphere because of continuous absorption of cosmic rays from space and ultraviolet radiation from the Sun. Classical physics and the Bohr model of the atom can qualitatively explain photoionization and collision-mediated ionization. The semi-classical description, however, cannot describe tunnel ionization since the process involves the passage of electron through a classically forbidden potential barrier. The ionization process can easily be explained by relative permittivity of the medium. The relative permittivity of air is 1.00058986 ± 0.00000050 or 1 and the relative permittivity of water at 20°C is 80. So, in water the electrostatic force acting between Na and Cl is 80 times smaller than that in the air. The electrostatic force between Na and Cl becomes so small, that it becomes difficult to hold the Na and Cl together in water. That is why whenever NaCl i.e. Sodium Chloride is dissolved in water, its molecules split into positive Na ion and negative Cl ion even at room temperature and below. This is ionization of NaCl. Water is not a good conductor, although it will certainly allow an electric current to flow through it, which is why it is dangerous to operate an electrical appliance near water. The amount of energy required to achieve ionization is called ionization energy or ionization potential. 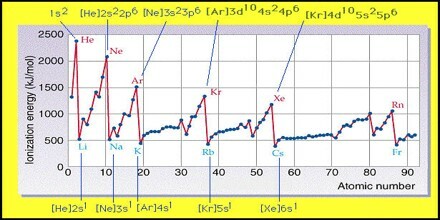 When an atom is at its normal energy level, it is said to be in a ground state. At that point, electrons occupy their normal orbital patterns. There is always a high degree of attraction between the electron and the positively charged nucleus, where the protons reside. 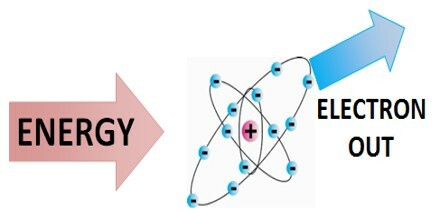 The energy required to move an electron to a higher orbital pattern increases the overall energy of the atom, which is then said to be in an excited state. Ionizing radiation, which causes ionization in the substance through which it passes, is extremely harmful. It should be noted that not all radiation is unhealthy: after all, Earth receives heat and light from the Sun by means of radiation. Ionizing radiation, on the other hand, is the kind of radiation associated with radioactive fallout from nuclear warfare, and with nuclear disasters such as the one at Chernobyl in the former Soviet Union in 1986. The term ionization also has a second meaning when used in discussions of solutions. The way substances behave electrically in water solution is often very different from the way they behave as solids or gases. As an example, consider the compound known as acetic acid. Acetic acid is a liquid that does not conduct an electric current. Yet, when acetic acid is added to water, the solution that is formed does conduct an electric current. Everyday examples of gas ionization are such as within a fluorescent lamp or other electrical discharge lamps. It is also used in radiation detectors such as the Geiger-Müller counter or the ionization chamber. The ionization process is widely used in a variety of equipment in fundamental science and in such as mass spectrometry and radiotherapy. A crystal of sodium chloride is made up entirely of ions, positively charged sodium ions and negatively charged chloride ions. The problem is, however, that these ions are held together very tightly by electrical forces. Sodium ions are bound tightly to chloride ions, and vice versa.